People tend to think that the world’s fisheries are in crisis: rogue states are plundering the world oceans, even ‘civilized’ states fight over marine resources – and fishers are notorious cheaters, focused on their own short-term gain and not on the long-term common good. As an expert on the Barents Sea fisheries, where Norway and Russia have jointly been in charge since the mid-1970, I hear such views all the time when I lecture and give comments to the press. There has been jurisdictional disagreement between the two coastal states, and spectacular arrests of fishing vessels occur from time to time – as when the Russian trawler Elektron kidnapped two Norwegian Coast Guard inspectors in 2005 – so a widespread image has emerged: that newly-rich Russian fishers do as they please and that the valuable Barents Sea fish stocks are close to extinction. The truth is rather different: stocks are in good shape, institutional collaboration between the two coastal states is conducted in a constructive atmosphere, and most fishers comply with most regulations most of the time. This may well be the case also in other ocean areas where governments and fishers alike have received an unfairly bad reputation. At least in international fisheries circles, the Barents Sea is now recognized as one of the most successfully managed large-scale fisheries in the world. In my book, Making Fishery Agreements Work, I attempt to pinpoint some of the reasons for this success. The book seeks to subsume theories of individual and state compliance under the concept of post-agreement bargaining. I pose two general questions: why do people obey the law, and why do states abide by their international commitments? In the literature, there are ‘formal’ models of compliance that largely presuppose unitary, rationally calculating actors driven by self-interest, with a concomitant social logic: a crime being committed, a common-pool resource destroyed, an international treaty concluded and subsequently complied with (or not). Empirically, these models are used to study how self-interest, deterrence and power play out in real-world situations. ‘Enriched’ models of compliance, by contrast, assume that actor motivations are more mixed and social dynamics less stylized and predictable. Here research efforts have focused on how norms, legitimacy and institutional organization affect compliance. The theory of post-agreement bargaining narrows in on how states promote the compliance of other states through inter-state communication after a treaty has been concluded. 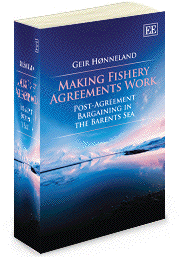 In Making Fishery Agreements Work, I show how Norway did not stop negotiating each time a new agreement was reached with Russia on a specific regulatory measure, but rather viewed bargaining as a continuous aspect of living under the agreement. Annual quotas were set by the two countries, but not adhered to by the Russians. Norway then took steps to document total Russian catches and introduce new reporting and control routines in order to halt the illegal fishing. When the Russians branded low quota recommendations from the International Council for the Exploration of the Sea as Western attempts to harm the Russian fishing industry, Norway first proposed a compromise in the form of a three-year quota, then a harvest control rule that bound the parties to precautionary reference points while also giving the fishing industry greater predictability. Gradually, compromise has emerged on most technical regulatory issues, such as minimum mesh size and minimal allowable length of fish, and new measures have been introduced jointly by the parties: satellite tracking of all fishing vessels, and the obligatory use of selection grid in trawls. On the fishing grounds, Norwegian inspectors have used widespread communication with the Russian fishing fleet – in Russian! – when jurisdictional disagreements have prevented the use of coercive action. The Joint Norwegian–Russian Fisheries Commission is the main institutional body for fisheries management in the Barents Sea. Bargaining might be expected to take place between the parties ‘over the table’ – at plenary sessions of the Joint Commission. In practice, I found two other main tracks of Norwegian negotiation efforts: from bargaining at lower levels to approval by the Commission; and bargaining by the two heads of delegation, with decisions subsequently anchored in the respective delegations. The Norwegians often saw the need to create ownership to the proposed measures on the Russian side. This was done by meticulous and persistent arguments (no short cuts), and by taking things in several rounds, from lower levels to the Commission itself. And the Norwegians had nothing against letting the Russian delegation leader credit his own side for the new regulatory inventions. Why did Russia comply with its international obligation to conduct fisheries management according to the precautionary approach? I maintain that the reason was not because this was in Russia’s declared interest, presumably not even its perceived interest. Quite the contrary, Russia followed suit more or less unwillingly, with Norway at the helm. Transnational seafaring norms and good-neighbourly relations may have tuned the negotiators in on a pro-compromise wavelength, but I find institutional factors best suited to explain Russia’s compliance. In the Barents Sea fisheries management, Russia gradually spun itself into an institutional web of increasingly more elaborate decision-making procedures, with Norway taking the leading role after the end of the Cold War. In part, the established formal and informal standard operating procedures led to decisions that the Russians would soon criticize – but they stuck to them. Moreover, there was in the Joint Commission a drive towards compromise that might to some extent have overshadowed strictly defined national interests, or at least have led the parties to interpret such interests as positively as they could, weighing them up against the possibility of reaching agreement. In the end, Russian negotiators were also satisfied with the result. At the time of writing, Barents Sea fish stocks are at an all-time high, and the Russians highlight the collaboration with Norway to the west as an example for emulation in their fishery relations with states in the Far East. The lessons learned include institutional, communication –and time. Geir Høn neland is Research Director at the Fridtjof Nansen Institute and Adjunct Professor of political science at the University of Tromsø, Norway. In his early twenties, he worked for five years as an interpreter and fishery inspector for the Norwegian Coast Guard, and has maintained his interest in cross-cultural communication and the determinants of successful fisheries management. In terms of wider theoretical work, he has focused on how identity and discourse play out in international relations.